Touch wood, but I’ve never been thrown up on – even when holding my friend’s hair back, not a drop has touched me. I couldn’t think of anything worse when you’re out – well maybe one or two things, but still. 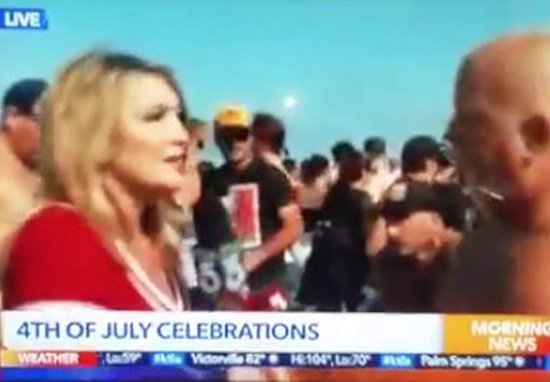 To get puked on is bad enough, but live on television? For one unlucky news reporter, who was covering the 4th of July celebrations in America, the unimaginable happened. Wendy Birch, a journalist for American station KTLA 5, was on a Los Angeles beach covering the July 4 Iron Man contest. The infamous contest involves competitors running a mile along the sand, swimming a mile in the ocean and then chugging a six-pack of beer. As beer-swilling competitors gather around Wendy, the scenes appear to be full of carnage – and it’s only 9am in the morning. This is getting ugly. This is a true test of endurance. However, as the pair are talking, Wendy is hit with sick that flies onto her from off camera. The footage, which was being repeated half an hour later, then cuts out and coverage goes back to the news room. It’s a locker room celebration ladies and gentlemen! 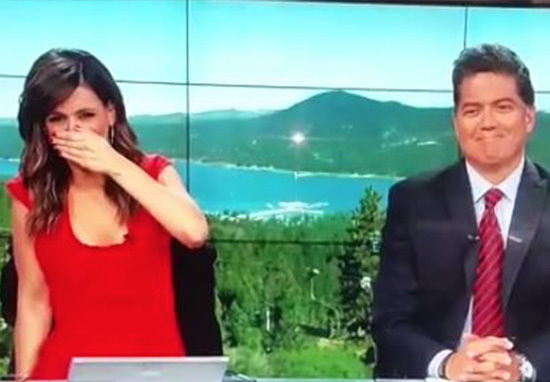 His co-host Christina Pasucci simply sits with her hand glued to her mouth in shock. My hope was that [the interviewee’s] broad… ah, erh… shoulders, could shield our morning viewers from the ups — and from what wasn’t staying down — in this competition. What I didn’t notice until later, is that he had a bullseye drawn on his back with the words ‘puke here’ written in magic marker.